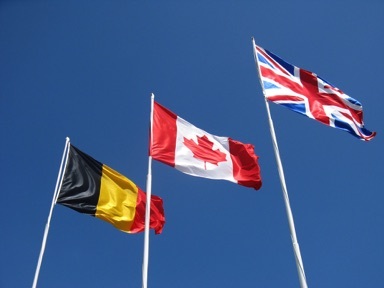 On 6 June 1944, British, American and Canadian troops landed on beaches across Normandy's coast – from Ouistreham in the east, to Utah Beach on the Cotentin Peninsula in the west. 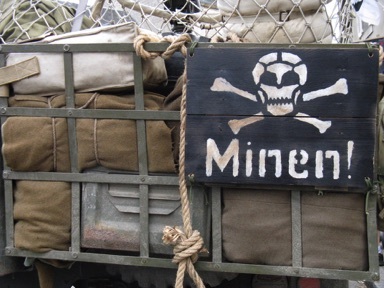 These invasions – code-named D-Day – marked the beginning of the liberation of Europe from years of Nazi occupation. 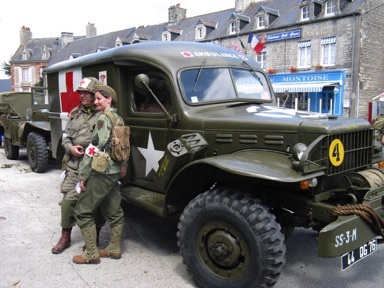 And each year, towns and villages across the region now hold events to celebrate the liberation, and to commemorate the soldiers that gave their lives and fought for freedom. 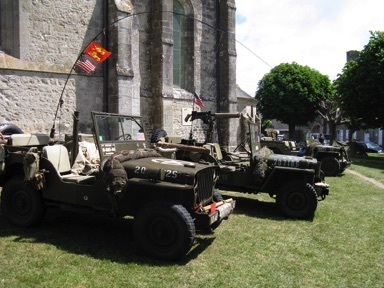 Two villages near Utah Beach – Sainte-Mère-Église and Sainte-Marie-du-Mont – were two of the first settlements to be liberated on D-Day. 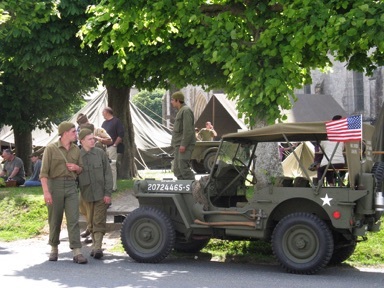 To celebrate, street parties are held on and around 6 June – with many local people turning out in 1940s dress, and vintage cars and jeeps lining the streets. The festivities attract visitors from all around the world, who crowd the streets to enjoy bands playing 1940s music, dancing, food and fireworks displays. There are ceremonies to remember those that lost their lives during the conflict, with visiting veterans as guests of honour. 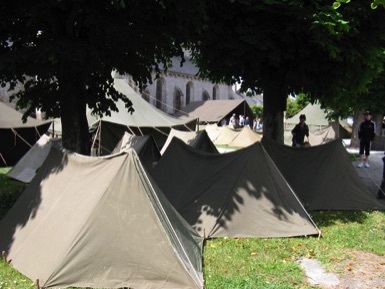 At Sainte-Marie-du-Mont, reconstructions of the military camps are set up – tents are pitched in the shade of the trees around the church, and people dressed as soldiers mingle with tourists and locals. In fields near Sainte-Mère-Église, parachute drops are held to remember the airborne troops that parachuted down into the area behind the coast during the night of 5-6 June. 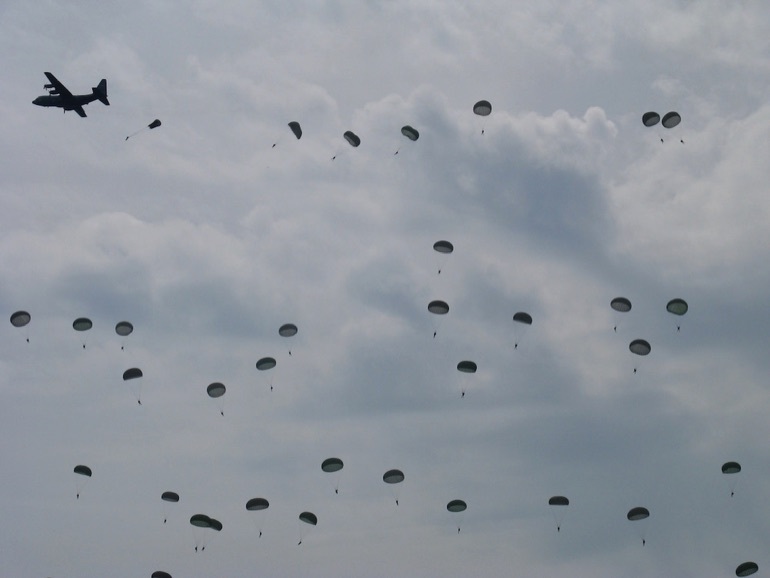 This is a spectacular display, with hundreds of German, English and American paratroopers jumping from C-130 aircrafts, their parachutes filling the sky. 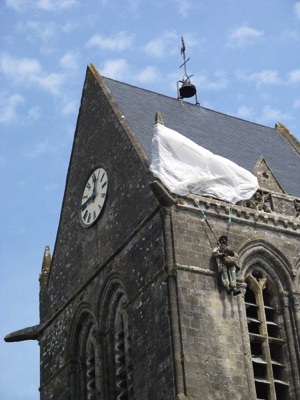 In the centre of Sainte-Mère-Église, a parachute hangs from the church tower, complete with an effigy of an American paratrooper dangling precariously high above the ground. 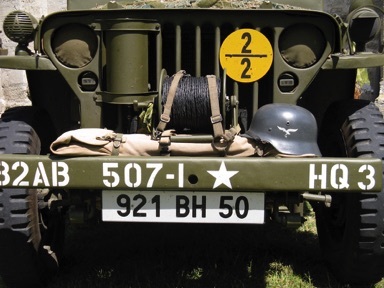 This is in memory of John Steele, of the 82nd Airborne Division. As Steele descended on the night of 5 June, he lost control of his parachute and got caught up on the church steeple. He hung there for two hours, while the fighting raged in the village below him, until he was spotted by two German soldiers who cut him down and took him prisoner. Steele was later released, and after the war was awarded the Bronze Star medal for bravery and a Purple Heart medal for wounds in combat. He continued to visit the village throughout his life and was made an honorary citizen. 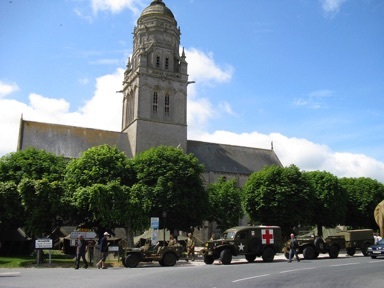 Information panels are placed all around the village of Sainte-Mère-Église, telling stories of the events of that night, as remembered by residents or reported in American regimental diaries. 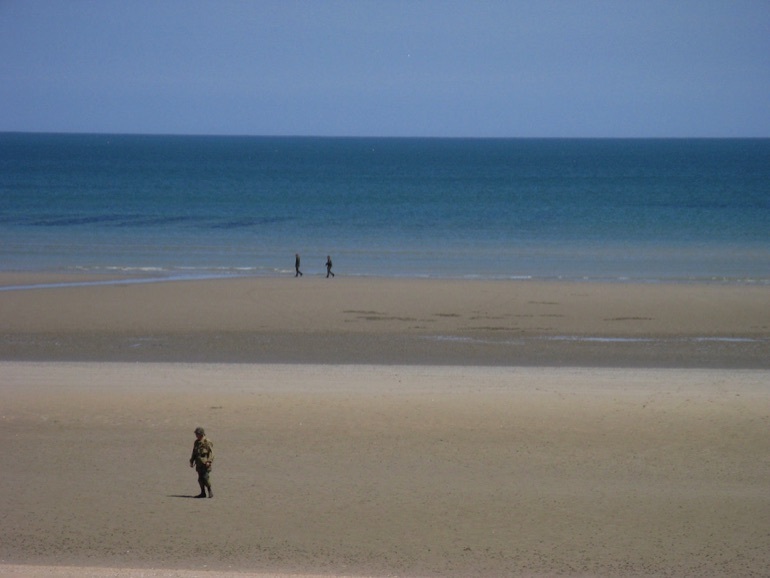 Along the Normandy coast, five beaches were code-named before the invasion: Utah, Omaha, Gold, Juno and Sword. The beaches are still known by these names today, and there are many D-Day reminders to be seen – including German bunkers, gun batteries, memorials and monuments. 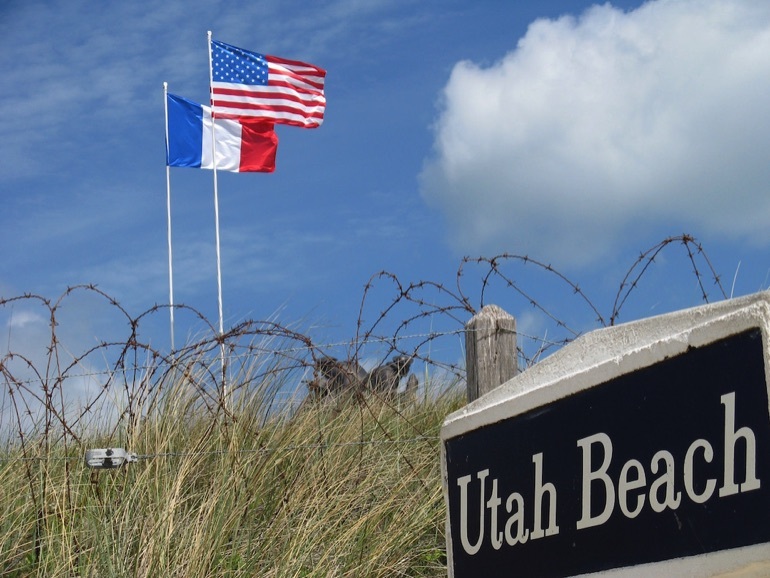 Utah Beach is the western-most of the Normandy landing beaches. Backed by marshland, grass and dunes, the beach stretches as far as the eye can see in either direction – and when the tide is out, it's a vast expanse of sand. 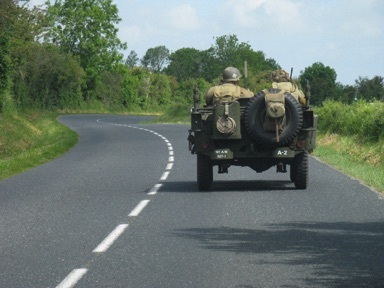 Twenty thousand troops and 1,700 motorized vehicles landed here with surprisingly few casualties – partly due to the support of paratroopers from the US 82nd and 101st Airborne Divisions, who were night-dropped inland to hold the roads that led to the beach approaches, preventing counter-attack from the Nazis. Directly behind the beach is the Utah Beach Museum. 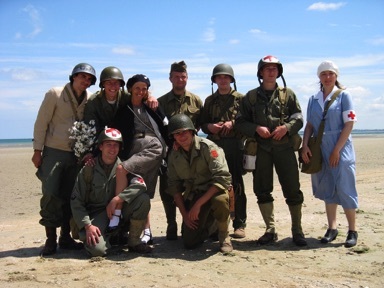 Here, exhibitions recount the story of D-Day from the preparation of the landing, to the final outcome and success. One of the key exhibits in the museum is an original B26 bomber – one of only six remaining examples of this airplane still in existence worldwide. There's also a series of monuments. 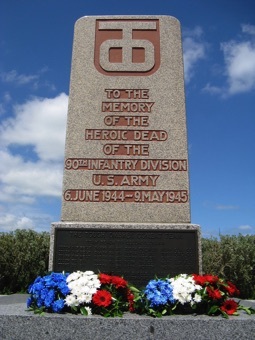 The Federal Monument of the United States of America honors the American troops who participated at Utah Beach, while the 90th Infantry Division Monument (below, left) is constructed with granite from Flossenbürg – a German concentration camp in Bavaria, liberated by the Division near the end of the war. Look out, too, for the Danish Monument. 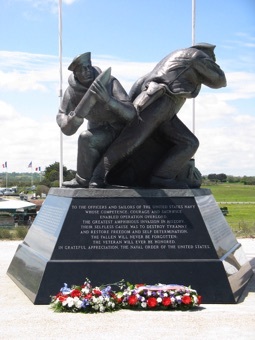 This is located a few hundred yards from Utah Beach – along the D913, between Utah Beach and Sainte Marie du Mont – and pays homage to the 800 Danish sailors who, although they did not land on the beaches, contributed greatly to the success of the D-Day landings. 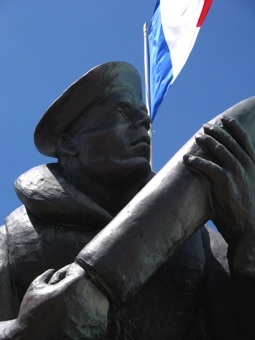 It is the only monument in France that honors the Danish contribution to the liberation of Europe. The US Navy Monument (above, centre and right) is the only monument dedicated to the US Navy outside the United States and features three powerful symbols: leadership, sailors, and combat units.